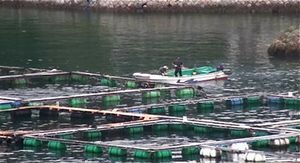 The European-based conservation group The Black Fish claims to have cut the nets of holding pens in Taiji, Japan, freeing "a number of dolphins" that had been selected for sale to aquariums and so-called dolphinariums around the world. The Black Fish used divers who swam out in rough conditions and cut the nets of six pens. The group claims no arrests were made.Fishermen in Taiji are participating in an annual dolphin capture that began on Sept. 1. The mammals are either sold or killed for meat. The hunt gained global notoriety last year because of the Oscar-winning documentary, "The Cove." Earlier this week, Ric O'Barry, the renowned activist whose efforts were featured in "The Cove," reported that several Risso's dolphins had been killed by the dolphin hunters. The Sea Shepherd Conservation Society recently documented the killing of pilot whales and Risso's dolphins. The Black Fish effort was the first act of vandalism this year on behalf of the marine mammals. Said group co-founder Wietse ven der Werf, "The connection between the dolphin entertainment industry and this annual drive hunt can no longer be denied. To be successful in our campaigns in Europe we need to get to the root of this illegal trade, which is right at Taiji." The annual hunt is backed by Japan's fisheries agency and several aquariums and dolphinariums purchase dolphins caught by the Taiji fishermen.